I hail from a family of introverts. It’s quite normal and acceptable for us to live under the same roof and exchange only two sentences every eight hours and be perfectly content. We bond over silences while engaging in activities that do not involve the other person directly, but still warm up in our shared solitude. We prefer writing to talking, and can articulate ourselves much better through the pen. When we do talk, conversations last for hours. When we do open up, we bare out our heart, mind, and soul. I was molded as an anti-extrovert, and then was let loose into a world of extroverts. When I fumbled and grieved, I was immediately asked to change, to revamp my whole temperament and learn to get under the spotlight, to self-promote, and push the envelope. This process of burying my true self was harrowing. I’d decided that I didn’t have enough in me to survive in this world where flamboyance is rewarded in every walk of life. Authenticity is ignored - if I don’t know how to grease the squeaky wheels, I suffer, and am misunderstood. In this exhausted and frustrated state I came across this book. A peek into the preface almost brought me to tears (as sappy as it sounds). I felt such a strong kinship with the author, that regardless of any other reason, I had to read this book written by a person who mirrored me. 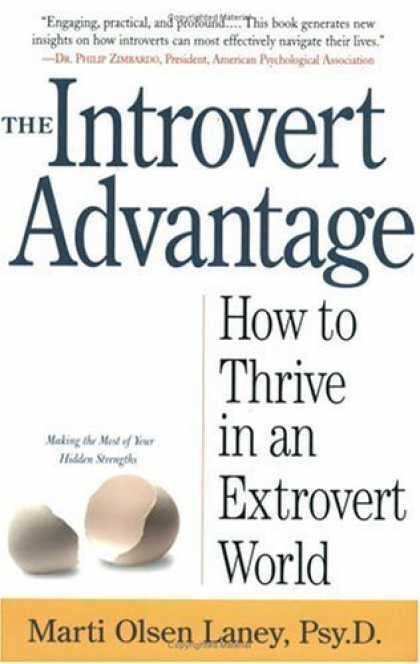 It’s a classic extrovert joke that an introvert has to read a book on introversion to learn about herself better, to get comfortable in her own skin, and extend her temperament to its fullest potential. 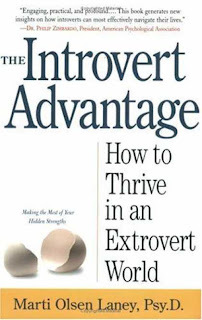 But well, going past it, the book sheds plenty of light on the physiological reasons behind introversion and extroversion, and provides practical suggestions on improving yourself, and your personal and professional relationships. Most of us grew up with a negative connotation associated with the term introversion. People diagnosed with it are urged to change and get out of their shells. From a practical stand point it makes complete sense. But one can't operationalize such a change just by “trying harder”. Dr. Laney brings out the fundamental difference between the two temperaments in terms of how they derive their energy or “dopamine hits”. Introverts draw energy from within themselves, while extroverts derive their energy from outside them - by being around other people, the constant hustle and bustle of activities, and the outdoors. Research has shown that extroverts are born with a long D4DR gene (named as the “novelty-seeking” gene) and are less sensitive to dopamine, due to which they need to stimulate their energy levels by often engaging in activities that titillate their senses (neuro-transmitters). On the other end of the spectrum, introverts are born with a short D4DR gene and are highly sensitive to dopamine, easily leading to over-stimulation and information overload. Quite literally, we are wired differently. Our neurotransmitters are different, the neural pathway in our brains that process information is different, and our metabolism is different. Clearly, there’s no debate on which temperament is better - both just tap into different resources, creating individuals who are unique in some ways. This revelation was such a huge relief to me. I have exhibited all the tell-tale signs of introversion - every time my brain blanks out, leaving me incapable of clever repartee or action, and I stand (virtually) like a petrified deer shocked by the glare of the oncoming head-lights, knowing very well that I’m going to be run over, but remain helplessly frozen, I feel immensely disappointed with myself, wondering why I’m such a dim-witted misfit. But when I realize that my thoughts go through a circuitous route through my brain, making processing time inevitably serial and time-consuming, I breathe. Since my thoughts take a hike on such a convoluted and deep trail, the outcome is (supposedly) more thorough and deep. This also translates to - faster rate of energy expenditure (combined with the increased rate of metabolism). We tire out soon, and our motivation to interact with people who don’t matter, and to put on a superficial exterior wears out thin. A weekend full of meaningless socializing is a nightmare. But we aren’t misanthropes. We do like people, want to be around them and socialize, and will even dedicate our life’s purpose to do human-centric research. But the effort expended to remain lively and bubbly all the time, outweighs the warmth. The book discusses how you can be yourself and still maintain a balance of extroverted activities along with the much coveted alone time with yourself. We sourly need that solitude to recharge ourselves. Another eye-opening point the book brings out is, being shy and inhibited is not the same as being introverted. Extroverts can be shy, and introverts can be uninhibited. Inhibition is an acquired personality trait, precipitated by fear of rejection, embarrassment, failure etc. While it’s possible to work on overcoming such fears, Dr. Laney argues that the core temperament itself cannot be changed. You simply work with who you are, accepting, acknowledging and taking “bite-sized” steps towards achieving what you want, despite who you are. It boils down to a blend of determination, and the open-mindedness to leave your comfort-zone at times, to achieve your ambitions. I really appreciated such a line of recommendation. It is empathetic and practical. The suggestions don’t push you over the edge; Dr. Laney insists that you pace yourself and set limits on how far, and how often you can stretch your limits. I like plenty of whimsy in my life. I have a soft toy of a snail hanging from my car’s rear-view mirror, to both remind myself and the guy behind me, that I am unfortunately a slow-crawler with sub-par motor-coordination skills. Ever since that acknowledgment, I see that I forgive myself easier, and can shush that over-critical high-pitched voice in my head that puts me down. I substitute it with the image of a dorky snail and try to laugh about it. And this is the same remedy that Dr. Laney recommends to introverts nagged constantly by their inner voice. Enfolded in such humor, empathy and practicality, the book is sure to help both extroverts and introverts better understand themselves and cope with each other. I have been eyeing this book for a while now- it's good to see a favorable review from you :).